MacKeeper launched Camera and Microphone Protection that protect users from unauthorised camera and microphone access. MacKeeper, a suite of 18 tools for security, cleaning, and optimization for Apple computers, is getting an upgrade to protect users from unauthorized camera and microphone access. 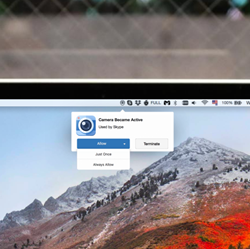 With the new Camera Protection and Microphone Protection features, MacKeeper monitors all third-party app attempts to access a Mac’s camera or microphone and immediately notifies the user. Cybercriminals are becoming more sophisticated at accessing sensitive data on Macs. According to the latest consumer reports, every eleventh Mac user has experienced a major spyware issue. These advanced tools protect MacKeeper users from unauthorized access to their webcams and microphones, providing an additional layer of protection against spyware. Both protection tools run in the background and don’t require any additional setup. Whenever an app or browser extension requests access to the Mac’s camera or microphone, the user will be automatically notified with a popup displaying the name of the app requesting access and the current connection status. The user can either terminate the connection or allow access. Easily manage apps attempting to access the camera or microphone. Clicking “Always Allow” places the app on the whitelist, granting permanent access so the user won’t see the popup again. New security features available in the new MacKeeper version are absolutely free for every MacKeeper customer. In the past few years, security experts have identified an explosion of new malware and spyware applications affecting millions of users worldwide. According to the G DATA 2017 report, every 4.2 seconds a new malware specimen emerges. MacRumors recently reported that malware attacks on Macs were up 744 percent in 2016. What’s more, in early 2017 security researchers discovered FruitFly, spyware designed for advanced surveillance on Mac computers. FruitFly can create a backdoor, allowing an attacker to remotely control a victim’s keyboard and mouse, access files, capture screenshots, and control webcams. “While we cannot detect an attempt to control the mouse or screen, at least we can notify users when someone tries to connect to the webcam. Today, a number of people feel unsafe because of webcam spies. We know thousands of cases of cybercriminals stalking people via their webcam, so security tools such as Camera Protection are must-have features for any computer user today,” says Alexander Kernishniuk, VP of Strategic Alliances at Kromtech. The new version of MacKeeper with Camera Protection and Microphone Protection features is available on the MacKeeper official website and via this link.